In West Virginia we have town governments, county governments, the state government, and the federal government. All of these governments govern the same people, in the same places. How does that work? Mayor Guy Ward of White Hall, WV and Michael Romano of the Harrison County Commission discuss Governments with Dan Ringer on this episode of The Law Works. This episode of The Law Works premiers on Nov. 14, 2013 at 8:30pm on WV PBS. Audio podcast of this episode of The Law Works. The Americans with Disabilities Act prohibits discrimination against people with disabilities in employment, transportation, public accommodation, communication and governmental activities. Sounds nice, but what does it mean to you and your family. 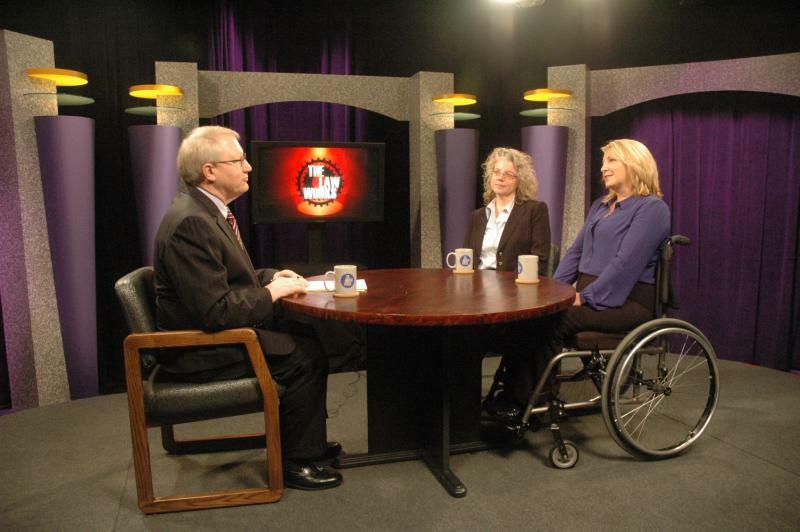 Beth Loy of the Job Accommodation Network and Carol Kisner McGraw, an Occupational Therapist join host Dan Ringer to talk about the ADA on this episode of The Law Works. Dan discusses the perils of computer online use. Why are some convicted criminal defendants sentenced more harshly than others? If two people commit the same offense, and are convicted of it, sometimes one goes home, and the other to prison. Why is that? Judge Alan Moats and Judge Russell Clawges join Dan Ringer to discuss Sentencing in Criminal Cases on this episode of The Law Works. When a defendant in a criminal case confesses to the crime, that should be the end of it. Right? What if the defendant then says, "no, I was lying," or says that the police forced the confession? Professor Valena Beety of the WVU College of Law and Attorney Ifeoma Ike join host Dan Ringer to talk about False Confessions on this episode of The Law Works. Are you active on Facebook, on Twitter, Pinterest, or other forms of social media? They can be fun. They can keep you in touch. They can be dangerous. Attorney C. David Morrison joins host Dan Ringer to talk about Social Media and Employment on this episode of The Law Works. This episode premiers October 17, 2013 at 8:30pm on WV PBS.